I’m still playing around with the recipes in Jim Lahey’s My Bread cookbook. As I’ve mentioned before (here, and here, and here, and once more here), the appeal lies in the simplicity of the no-knead technique and the wonderful, rustic texture, featuring a thick, crunchy crust and open, irregular crumb. Too often, though, I’ve been disappointed in the flavor of the resulting loaf breads. Not anymore: I finally made a Lahey no-knead I really, really like! 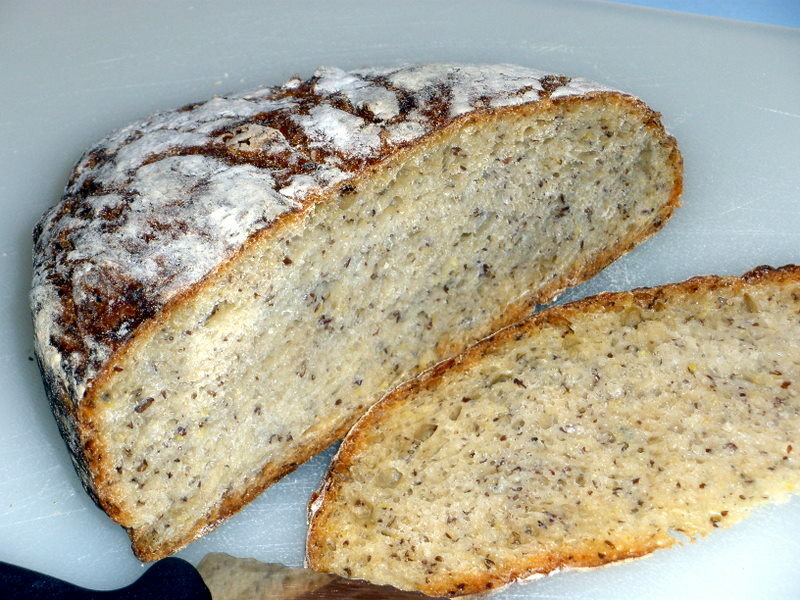 I started with his Pane Integrale recipe, a part-whole-wheat loaf (p. 61), and tossed in some ground flaxseed. Wow–a burst of flavor and more interesting texture. Try it yourself….ground flaxseed is sold alongside the nutritional supplements & vitamins in most big-box chain stores. Once opened, store ground flaxseed in the freezer for best flavor. 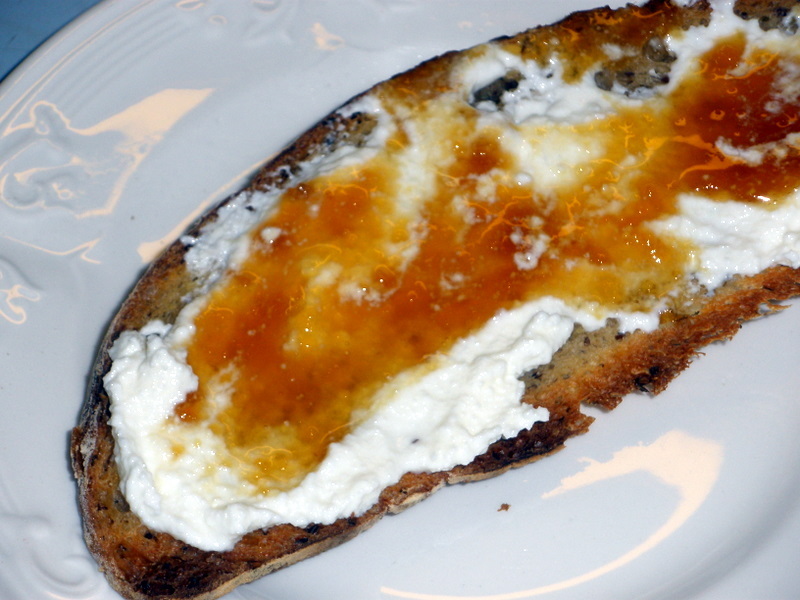 I especially like this bread for breakfast when thinly sliced and toasted, then spread with whole-milk ricotta & drizzled with honey. In a large bowl or lidded plastic tub, combine bread flour, white whole wheat flour, sea salt, flaxseed, and yeast. Stir in water to make a shaggy dough, and continue to stir for 1-2 minutes until all of the flour is hydrated. (If ambient humidity is low, sprinkle in an additional 1-3 tablespoons of water to ensure that all of the flour is evenly moistened.) Cover the container and rest at 70-80 degrees for 12-16 hours, until the surface of the dough shows bubbles and it has more than doubled in size. Generously dust a counter or bread board with flour. Using a plastic dough scraper or spatula, scrape the dough out of the container in one piece and place on the floured counter. Very gently, round the dough blob into a ball. Heavily dust the upper surface of the ball with flour and cover with a (non-terry) kitchen towel. Rest for 1-2 hours until almost doubled. Half an hour before baking, preheat oven to 475 degrees, and place a 3.5 to 5.5 quart, enameled cast iron pot into the oven to heat. When the dough is ready to bake, remove the heated pot from the oven, place the dough ball carefully inside the pot, and slash the top of the loaf three or four times with a razor blade or sharp knife. Quickly cover the pot and return it to the oven. Bake, covered, for 30 minutes, then remove the lid and bake 15-30 minutes more, until the crust is deeply browned but not burned. Remove baked bread from the pot and place on a wire rack to cool before slicing. Check out the Wild Yeast blog for Yeastspotting, the best of breads from around the Web.